So beautifully composed, gorgeous colours Anemones have don't they? Thanks so much for visiting and commenting Eden and Ruth ... glad you like my latest flower photography gallery addition! Anemones have these bold saturated colors and I love to photograph them Ruth. A few weeks I found a purple one (http://juergen-roth.artistwebsites.com/featured/daughter-of-the-wind-juergen-roth.html) and last week I brought the red one home ... can't wait to see what will be next. 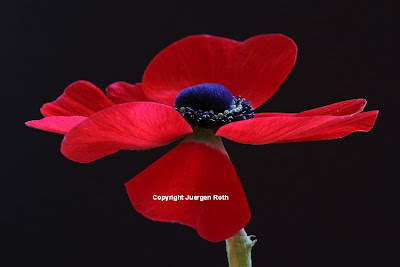 Thanks a million for visiting and commenting Toni ... glad you like the bold colors of the red Anemone flower photography image!